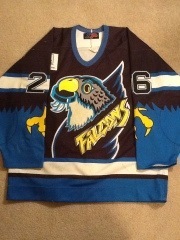 I have a lot of jerseys. 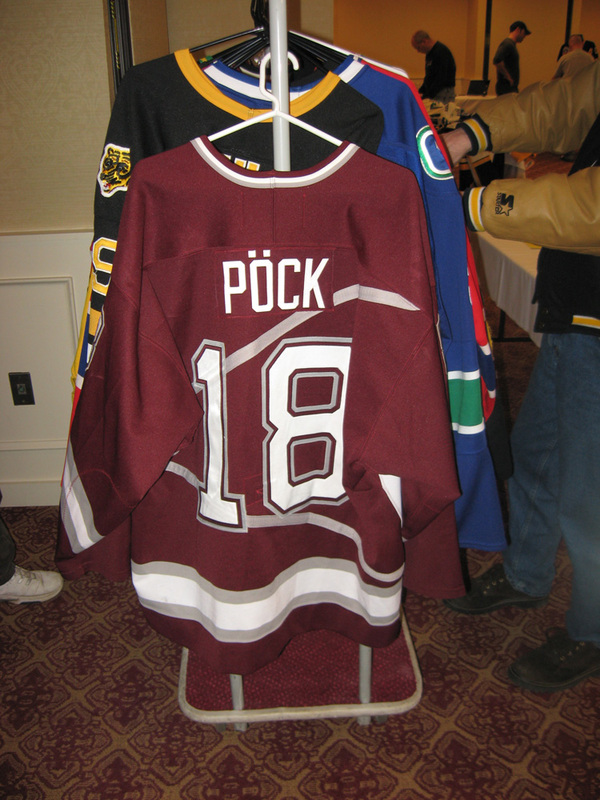 Being a UMass fan for as long as I have I’ve gathered a bunch over the years as the styles have changed and I wanted a replica to go with whatever the team was wearing on the ice. 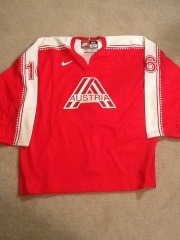 It actually took me years after becoming a fan to procure my first jersey however. 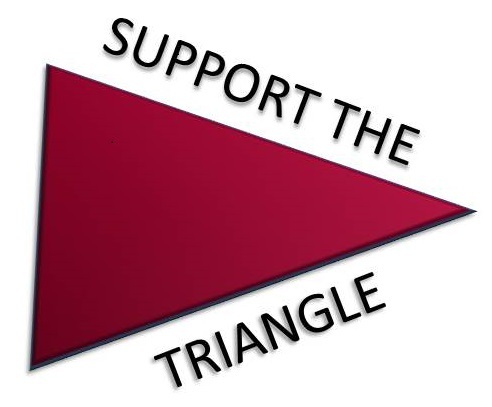 I think I actually ordered my first replica home triangle during the short time I was living in Michigan sometime around 2000. 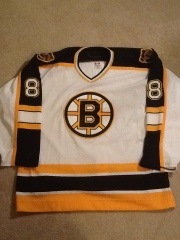 Since that time I also picked up a black/alternate “Massachusetts” variation they wore a few years back (one of the shine ones, before they switched to the matted look). 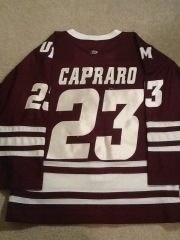 I also have this odd ball maroon jersey with the block UMass logo right after they retired the loopy u logo. 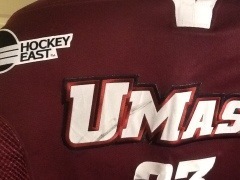 What makes it oddball is that the UMass logo is also maroon and the team never actually wore a maroon logo on top of the maroon material. 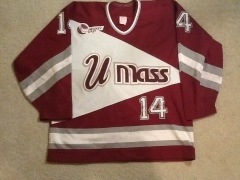 Somewhere along the way though I thought I it’d be cool to pick up a gameworn UMass jersey as well. 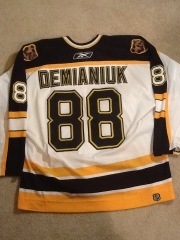 For those that don’t know the gameworn jersey hobby is a huge part of the collecting business. eBay is filled with them and there are even regular trade shows where collectors and dealers show off and hock their wares. I once went to one of these shows and was able to see the jerseys that Ray Bourque wore the night of the Phil Espisito retirement ceremony, both the #7 and the #77 that he exposed in a moment area hockey fans have seen thousands of times. Well after that I was hooked and looked for opportunities to get other gameworns of UMass players. 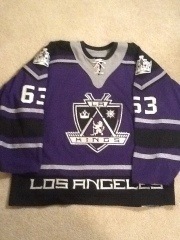 At a trade show a couple years later I was able to purchase my one and only triangle gameworn. 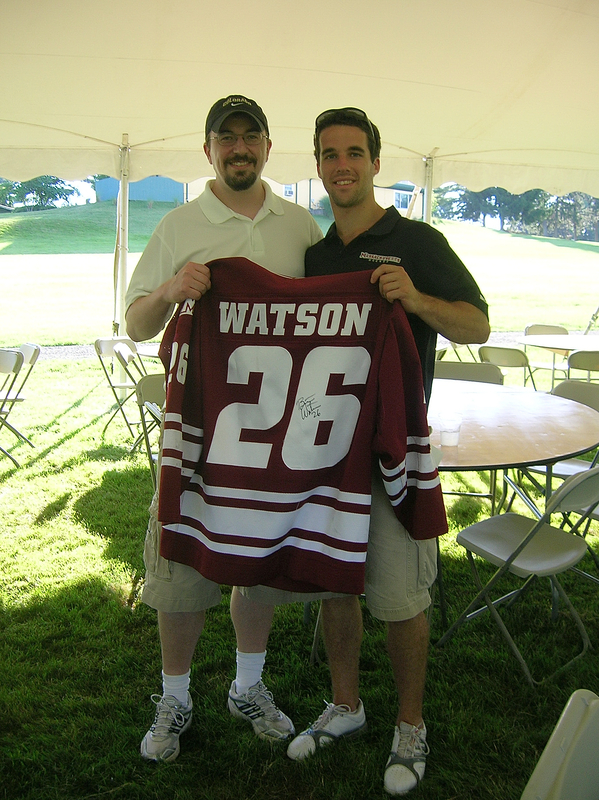 It’s the jersey of Warren Norris, UMass’ third leading scorer all-time, and you can see I’ve put it to use in helping to decorate the blog. 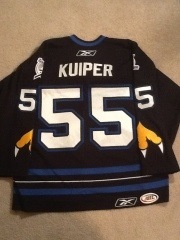 Judging from all the rips and stitching, he must have worn it all four years. 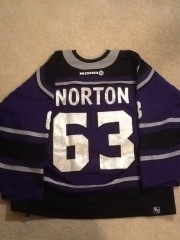 I’d love to find a Red Wings Norton jersey, perhaps with the Yzerman retirement patch, but that would be a tough one to locate and then afford. 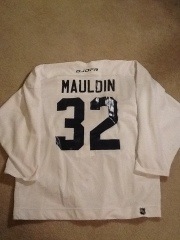 I was able to get this Greg Mauldin practice jersey from when he was with his draft team, the Columbus Bluejackets, for fairly cheap. 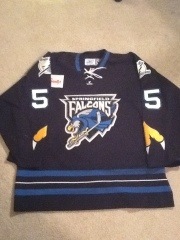 Over the years I’ve even branched out from UMass hockey and even added a UMass football gameworn (which made the trip all the way down to Chattanooga in 2006) and a Colorado football gameworn. I don’t look to procure UMass gameworns nearly as much as I used to, mostly because it’s damn expensive and I don’t wear jerseys to games that often as I used to. But I still do keep my eye open for opportunities to add one to the collection and almost added a Mike Johnson triangle over the summer (damn you Wardy). 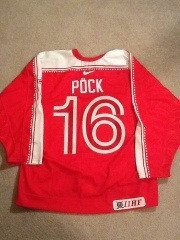 The two I’d most love to find, my “grails” as it’s called within the hobby, would be a Rob Bonneau triangle and a very rare Thomas Pöck triangle, as he only wore it for his first season. So far I’ve found digital evidence of it, but that’s it. Anyway, that’s it for my collection. For a while it was a bit of an expensive obsession, but overall I find it fun to have such unique pieces of of the team I follow so closely. In the end they’ll look great on the walls of my future beer snob/sports bar I open in the Amherst area after I win the lottery. Yes. 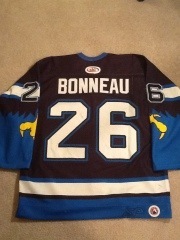 I hate how eBay allows other people to bid on stuff. Had no idea you had a massive collection! Whenever you have kids we still have the one you gave Justin. i have an ortiz if someone wants it $175.